Record up to 26 tracks simultaneously. If you need the ins and outs, this has got the lot. Compact design. Has just about everything. Comes with decent software. The Firestudio is an all-in-one recording studio. Eight mic amps and 18 channels of ADAT in/output feature. Setting your 19-inch rack audio interface apart from the hoard can be difﬁcult. It's no secret that new audio interfaces are passed around the FM test crew like hot potatoes. Just how many times can you extol the virtues of a box that makes no noise? The PreSonus was in danger of suffering the same apathetic fate, if it wasn't for the fact that what it does, it does brilliantly well. Its main sell is its inordinate number of ins and outs making it ideal for pro environments. As a buffer between a full-sized desk (with band attached) and a computer, it's hard to imagine a more transparent and easy-to-use unit. The rack unit itself is surprisingly tiny - 19 inches wide (of course) but only six inches deep. It's therefore eminently baggable and gigable. That said the unit requires mains power despite its FireWire connection so you won't be recording in a ﬁeld with this one. 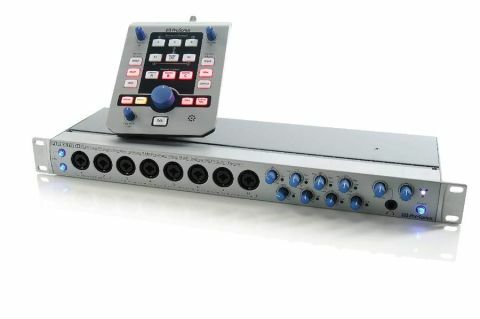 The FireStudio is a complete 24-bit/96K recording system with eight Class-A PreSonus mic amps plus up to 16 channels of optical ADAT input and output. There's S/PDIF, BNC word clock and MIDI in and out too. And to co-ordinate the lot there's also a 36 x 36 x 18 zero latency mixer/router application in the box. This bit of software, while simple, is a real bonus. It comes with Mac and PC versions and gives a vast bank of sliders and mix options to really go to work with the 1U ins and outs on the box itself. You can mix together audio from the computer's audio engine, and any of the mic-pres or inputs, grouping together pairs of sliders for stereo ins where necessary. And when you've got everything sounding perfect you can take a snapshot and save it to any one of nine locations. Sound-wise the FS is brilliantly transparent. Mics sound warm and in your face, while ins from keyboards come through sparkling and unfettered. The on-board gain controls cope with anything thrown at it, new or old. The FS comes into its own when teamed with a DAW and it was set up and working in Logic within minutes with all the ins and outs visible within the program's mixer. The MSR remote unit also came out of testing unfazed. This add-on, paper-back-sized box links to the FS via an ethernet lead (supplied) and gives you full control of the box and even a pair of headphone outs. For switching between monitors, dimming the output or setting overall volume levels the MSR lets you put the FS rack and associated spaghetti out of reach while you enjoy ﬁngertip control from your chair. The dedicated 5.1 switches make soloing and mixing for surround a doddle and the built-in talkback feature is welcome for bigger installs. The FS and MSR might seem like overkill for small studios but the added luxury of its quality and facilities make it worth the extra. If you need a ﬂexible workhorse for recording bands, you can be conﬁdent that the FS has everything you need and more.